Spike in prices of pulses is no good news for India even as the New Year (2016) would usher us into the United Nations International Year of Pulses. The pulses are in the daily consumption basket for a majority of Indians. Proteins constitute 35% of the nutrients in pulses whereas wheat and rice have low proteins (8% only). Due to their high protein content, the pulses are called the ‘poor man’s meat’. Against a demand of 22 to 23 million tons of pulses, their domestic production has stood around 18 to19 million tons annually. The pulses production is suffering from structural problems like inelastic supply due to lack of high yielding technology. The shortfall is compensated by import of three to four million tons every year. As per the Indian Council of Medical research (ICMR) recomendations, India needs to produce 40 million tons of pulses annually in order to provide recommended 80 gram per day per person intake of pulses for 1,282 million population as it stands today. In various retail markets pulses prices started rising since November 2014 and continue to be higher until now and reached Rs.200/kg in Delhi and Mumbai markets. It is mainly due to steep decline in domestic production from usual 19 million tons to 17 million tons during the last two years due to back to back drought with simultaneous global short supply. With two consiquitive droughts, India could have been taken preemptive action by importing earlier than later to maintaining buffer stock of pulses at least 40,000 tones. Sensing the higher prices, local traders tried to hoard with the expectation of further increase in prices as there is no scope of fresh harvest entering markets until December. The recent seizer of 80 thousand tones of pulses indicates the extent of manipulation in the pulses prices by middlemen and commission agents. Further, with the news spreading that the India will start large scale import of pulses, world exporters raised prices. In the next three months, about 2.5 million tons of pulses imports will reach India, which will also coincide with domestic harvest and there is a likely possibility of prices fall. To avoid late initiation by government to import pulses and to reduce price volatility, there should be need for price monitoring to forecast domestic supply and demand situations so that the timely imports and other corrective measures will be done. The touch of irony cannot be missed while assessing the pulse situation vis-à-vis India. India is the largest producer, consumer and importers of pulses in the world. It accounts for 33% of the world area and 22% of the world production of pulses. About 90% of the global pigeonpea (Tur dal), 65% of chickpea (Gram dal) and 37% of lentil (Masoor dal) area falls in India, corresponding to 93%, 68% and 32% of the global production, respectively. But one would fail to comprehend the full significance of the current crisis, if the nature of the pulse market is ignored which is highly price and income elastic. To put it in simpler terms, consumers demand more pulses if incomes rise and prices comes down. 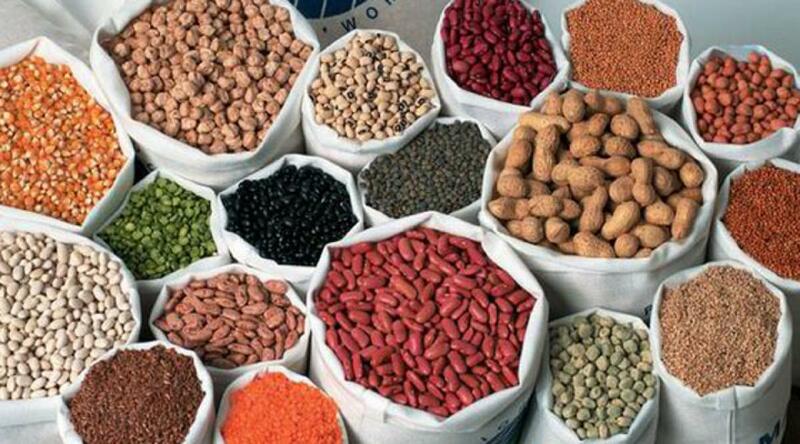 Going by this yardstick, the pulses demand is set to increase to 26 to 36 million tons in the foreseeable future. The remedy should be two-pronged: boosting the production and enhancing the productivity. To discuss the latter first, productivity of Indian pulses is low i.e., around 800 kg per hectare against 2,000 kg per hectare in Canada and Australia, the major pulses exporting nations. The yields of rabi(post-rainy season) pulses (chickpeas and lentils) increased significantly in recent years beyond one ton/ha, while kharif pulses (pigeonpea, moong and urad) are stagnant at 0.5 ton/ha and needs technological breakthrough. The major policy variable intervention like Minimum Support Price (MSP) is not effective in case of pulses, as since 1990s MSP of pulses is very much below the market prices, there was no large scale procurement of pulses unlike paddy and wheat. Import policy of pulses is ad-hoc and kneejerk to meet the short term imbalances in demand and supply, which often escalate price volatility rather than decrease it. The pulse production suffers from area stagnation with farmers shifting to more remunerative crops where new technological input has led to enhanced productivity and stable prices especially in northern India. A shift in crop preferences by the farmers has been seen since the 1990s. Indo-Gangetic belt farmers who grew pulses earlier, have increasingly taken to wheat production where yields range from 3,000 to 4,000 kg per hectare compared to only about 800 kg in case of pulses. Over the past two decades production of pulses shifted from northern India to central and south India in large scale. Today, 80% of pulses production happens in six states namely, Madhya Pradesh, Maharashtra, Rajasthan, Andhra Pradesh, Karnataka and Uttar Pradesh. Secondly, productivity was almost stagnant except chickpeas over decades. Productivity and area of chickpeas has increased mainly due to introduction of high yielding varieties like JG-11 in south India. Today chickpea occupies almost 45% of the entire pulse production. Pulse production has suffered neglect at the policy planning level too. The major focus since 1966 has been on paddy and wheat, primarily in order to achieve food self-sufficiency, and later food security. These were quite justified goals with remarkable achievements. As a result, the area under paddy, wheat and also sugarcane increased in high-productive zones with higher use of subsidised inputs like irrigation, fertilizers and pesticides. Studies show that about 70% of the farm subsidies go to these three crops. Pulse crops shifted to marginalized lands with no or little irrigation and inputs and consequent low supply response even though prices are high. Area under irrigation was only 15-16% for pulses(only 8% in pigeonpea), where as it was 100% in wheat and sugarcane and 80% in paddy. The high bargaining power (political pressure) of large number of paddy and wheat farmers leading to excessive incentives to these crops at the cost of crop diversification towards pulses and oilseeds. Further, urban consumers are vocal against rising pulses of pulses, which acts against incentivizing farmers to grow more pulses. After experiencing higher retail prices, many state governments taken short run measures like persuading traders to reduce their sale prices in domestic markets, distributing imported pulses through public distribution system at subsidised prices and stringent action against hoarders to relieve price pressures in short run. To reduce prices in the long run, there should be emphasis on adoption of new technology to reduce cost of production and increase domestic production. Both price and technology played a role in increasing production from 15 to 19 million tones between 2009 and 2013. For example, with very low production of 14 million tons in two consecutive years in 2009 and 2010, central government started pulses production programme (PPP) in 6000 villages under National Food Security Mission resulted in increase in pulses production up to 18-19 million tons by 2014-15. This increased production facilitated by positive signals with steep increase (40%) minimum support price. There is a need to expanding pulse area under rice fallows in eastern and northern India which can easily contribute an additional 2 million tons of pulses. Crop diversification from rice-wheat to rice-pulse based cropping in northern India can also contribute to another 2 million tons. Further there is a need to increase average yield to at least 1t/ha from the current 0.75t/ha, which itself contribute to about 6 million tones of additional pulses through wider adoption of newly developed short duration and drought tolerant varieties and good management practices. From policy front, it is also important to maintain stable price policy like maintaining price band, beyond which government will intervene. There is a need for procurement and maintenance of buffer stocks by purchasing pulses at or above MSP in peak harvest season. Strengthening price monitoring to sense market trends, and to import earlier than later without declaring openly to give less time for exporter’s price manipulations. The existing stock limits of 300 ton for traders and 50 tons for retailers needs to be relaxed to promote national market for pulses to adjust stocks to prices in space and time to reduce price variation. It is also important to keep in mind, the consumer preferences. Consumers prefer to consume pigeonpea even above Rs.70/kg, while yellow peas are not preferred even at Rs.14/kg even though its availability was plenty in international markets. Strengthening futures trade also reduce price variation as the currently futures prices of pulses are ruling below spot prices. Pulses are a basket of a variety of pulses. They are grown thinly and scatter across larger areas, which make it difficult to reach by both private and public sector seed companies and extension agencies. Hence, it is important to develop some sort of aggregators and producer companies with long term goals of promoting pulses. Government needs to establish special purpose vehicle to promote pulses with a minimum fund of Rs.500 crores to increase supply response. Post-harvest technologies to reduce losses in the value chain also should be given priority. Not to be overlooked is the fact that pulses are the most sustainable crops from ecological angle. They contribute to soil quality by fixing nitrogen. Moreover, it takes just 300 liter of water to produce one kg of pulses, compared with 1,802 liter for soybeans and 3,071 liter for groundnut.